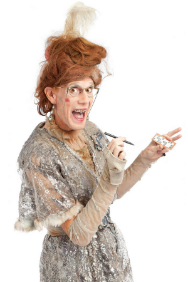 Ida Barr - Granarchist Bingo tickets at Southbank Centre, London. 2019. Saturday, 29th June 2019 to Saturday, 7th September 2019. 15:50 on 29 Jun and 7 Sep.
Ida Barr - Granarchist Bingo tickets: The tabs above allow you to select between links to suppliers and date searching. Click on a supplier's logo to see their details and on the 'buy now' button to see and check the tickets on offer.